Sheikh Nadim Gemayel, the latest security events that are to pave the way for work to attend and that the arrival of the other team to the rule would change the face of Lebanon, he said, adding that the success of the Group is a referendum against the sovereign to disarm Hizbollah. He called for Gemayel, in an interview with the "LebanonFiles", Lebanese, and clinging to their cause but will relinquish the international community, stressing that the Syrian regime is one of the two martyrs killed by the two presidents, Bashir Gemayel, Rafiq Hariri, and there is a political practice of the liquidation of the political right of the symbols of Christian leadership in Lebanon. What is your comment on the recent security incidents and those who stand behind it, and end them? What is happening is not allowed, and the recent kidnapping incident in the southern suburbs of Beirut took place in the Party of God, where has the authority, and we call on the State to extend its sovereignty over all Lebanese regions and will only be to the security situation may Mtfelt to cancel or to postpone the elections, there's no doubt that these events are in the box They intimidate people to pave the way for work. What if the arrival of the other side to power, why this concern in the event of a democratic people have brought this team, not to believe in democracy? Iran came to power in democracy, but changed the face of Iran, I am asking people not to get the other side to power so as not to change the face of Lebanon. In the case group did not receive the March 14 parliamentary majority to come, Fsnard within the institutions to preserve the Lebanese national politics, not policy Twtmr of Iran and Syria. In the event Vzatm majority, what will change, because we stay on its current form? The sovereign is the success of the working force a referendum against Hezbollah and Syria's allies in Lebanon, and, if acquired the confidence of the people, particularly in Christian areas, we will cover Ozhna Christian Hezbollah, which is why our tragedies. Our access to the Parliamentary Council majority will give us more credibility and legitimacy in this regard. Ttakovon not of any regional agreement would come at the expense of Lebanon, and then will become the slogans of the past March 14? When we have for our case would give them the world, but we will not abandon them even if it is abandoned. Our cause is the cause of right will not give them. Why Tstbakon the outcome of the investigation into the assassination of martyr Prime Minister Rafik Hariri, when you said that Hariri was the same deadly killer of President Bashir Gemayel, the martyr? These expectations are based on the actions of Syrian intelligence in Lebanon from the threats and acts of President Al-Assad is the last bombardment, which had not forgotten, and is also clear that the killing of President Bashir Gemayel was killed Syrian President al-Hariri and Syria came under orders of these expectations, as I said based on the actions of Syrian policy in Lebanon. What are the dimensions of the campaign against the Maronite Patriarchate in your opinion? What is happening since 4 years now is the political assassination of all the Christian symbols of national leadership, led by the Maronite Patriarch, by allies of Hezbollah and the Syrian regime. Can people count on you being the election of the son of the martyr President Bashir Gemayel? The name of the martyr President not to trade in the exploitation, I will not trade him. Bashir was the greatest and most noble of the topic of elections, is the national project and I will try to implement what can it not only through the prosecution, but also through ongoing daily struggle. 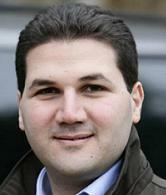 In the absence of receiving the election, does that mean the dream of the fall of President Bashir Gemayel? President Bashir Gemayel was killed did not die, they are trying to assassinate the symbol of President Bashir Gemayel in any of these elections, but I can not. Our struggle will not stop at the borders of these elections and we are to achieve the intention of the slogans that brought Bashir adopted the public March 14.
Who is the holder of the dream of President Bashir Gemayel, at the national level now in Lebanon? Of all the Lebanese who believe in freedom and sovereignty of Lebanon. What is your development of the first cycle of Beirut, and what Stadhavouna to everyday political discourse? I will seek to change, starting Btrohat, ideas and performance. I am the owner of the project and not a political election, and the only non-League First Circuit in Beirut, I on behalf of all of Lebanon, particularly the areas of Christianity, and Christians will be a periodic payment to the State and to engage in confidence after they were overshadowed during the past period, and when I invite the realization of the rights of Christians. To any parliamentary bloc will join me in the event of your election? I am a member of the Lebanese Phalange Party is only natural that I should be in the parliamentary bloc, and there will be close cooperation with the Lebanese Forces bloc and the rest of the opponents of the March 14 to achieve the national aspirations. What is your attitude towards the reconciliation of Christianity and whether there were hindered? I was one of the first proponents of this reconciliation, I believe its importance, and not to be a Christian in the face of others, but to be dialogue between them and address their differences with wisdom, not Rancorously and "a settling of accounts" and this will impact on the Lebanese public interest. You receive the Secretary of the Iraqi Christian, is trying to revive the Christian in the Middle? And where to secure the rights of the Taif Christians? Martyred president, Bashir Gemayel, is a Christian in Lebanon and not a Christian, and if the Christians of Lebanon will be strong Christians Middle powerful also because Lebanon is the last bastion of freedom in the Christian East. The Taif is the constitution of Lebanon, which is equal sharing of security that must be preserved under some of the modern ideal and these are some who claim to preserve the Christians and their role in Lebanon, the ideal would be the biggest mistake against the political presence of the Christians. Taif also called for administrative decentralization, which must be applied to a reservation in order to foster the development and security in the regions. Is Ttakovon the Christian presence in the future? Christianity has been persecuted in the Middle and the difficulties and Ajtazatha, an idea that does not die, no one can it. And learn every day more than ever the threat to and we are ready to defend our existence and our mission. Is this decentralization is the prelude to a federal, federalism: What do you think? Decentralization or Federal or other regulations, are the means and the larger goal is security, equality and freedom in the Lebanese society, if the solution is to let the federal, or in the case were not Flanbges on another system, and in my opinion the application of administrative decentralization is the solution. What do you say to the comrades of President Bashir Gemayel? I tell them that Bashir did not die, and Bashir said that if there was another harbinger of Weston Sixty thousand years on the case, I would say that the Lebanese resistance fighters are the secretariat of the debt and the issue is in our hands to hand to our children.